With the NHL and accompanying fantasy hockey season right on our doorsteps, now is the time to start preparing for your drafts. The following is a Vancouver Canucks fantasy analysis or both fans of the club and those needing more knowledge on who’s on the rise and who’s declining with the club. You’ll also find point projections for each player guaranteed a roster spot, a rookie to look out for and a sleeper player that will fly under the radar in your draft. After a solid rookie campaign in 2014-15 that saw him score 25 points in 68 games, Horvat looks to emerge as the Canucks’ 2nd line centre for this coming season. After scoring 16 of his 25 points over the course of the final 38 contests, as well as becoming a driving force for the club during their playoff series against the Calgary Flames, Horvat projects to have a very respectable sophomore year. Look for an output in the 40-45 point range. Yannick Weber was one of the under-the-radar surprises of 2014-15, scoring 11 goals, many of those being in the later stages of the campaign. The 26-year-old Swiss defender managed to steal a top-four spot from now-Anaheim Duck Kevin Bieksa, and projects to be in that same role this upcoming season, in addition to being the go-to point-man of the first unit power play. Due to finally having a full-time role with the club, look for double-digit goals once again from Weber. Much like Weber, Tanev, 25, will benefit from the absence of Bieksa on the right side. While Tanev has never been much of a point producer from the back end, he may very well end up getting some 2nd unit power play time, and perhaps making a 30-point campaign a real possibility. In Pittsburgh, Brandon Sutter was overshadowed by a couple of decent players that go by the names Sidney Crosby and Evgeni Malkin. With all due respect to Henrik Sedin and Bo Horvat, they aren’t nearly the players that those two are, meaning Sutter may have more a chance to move up the lineup, as well cash in on some increased power play time. 50 points is a possibility for the 26-year-old centre. Henrik Sedin surprised last season with a 73-point campaign, a welcome rebound after barely putting together 50 the year previous. While 70 points might still be a conceivable target, somewhere in the mid 60’s seems a bit more realistic, considering both his age, and the age of his likely line mates Daniel Sedin and Radim Vrbata/Alex Burrows. For many of the same reasons as his brother, a reasonable goal for Daniel would be somewhere in the 15-20 goal, 65-point range. While he used to be known as the scoring twin, over the past couple of seasons, Daniel has put more of a focus on the play making aspect of his game, resulting in declining goal totals, meaning 20 is no longer a guarantee. However, many have put plenty of emphasis on the Sedins’ age throughout this off-season, with plenty of people projecting totals as low as the 50’s, and if the members of your league think this way, taking him in an earlier part of the mid-rounds would be extremely solid value. While 31 goals was a fantastic surprise from the Czech sniper in 2014-15, it’s hardly something that should be expected again. With goals getting harder to come by, a spot with the Sedins not a guarantee, and Vrbata getting up there in age, 25 should be considered a success all things considered. A nice pick in the latter half of a draft, but don’t bank on the 34-year-old becoming a top-10 goal scorer once again. During his four and a half year tenure as a Canuck, Chris Higgins has often been relied upon in a top-six capacity, with mixed results. Heading into the 2015-16 season, Higgins, 32, those opportunities seem to have mostly passed, with younger options such as Bo Horvat and Sven Baertschi poised to at least push for spots on Vancouver’s top two lines. It’s very possible that Higgins starts as a winger on the 2nd line, but the probability that he stays there throughout the entire season is low. Expect a gradual decline in production similar to what he’s experienced over the past few seasons. 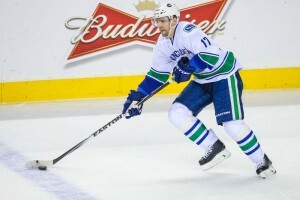 After being acquired at the 2015 trade deadline from the Calgary Flames for a 2nd round pick, Sven Baertschi lit up the American Hockey League, scoring 15 points in 15 games with the Utica Comets. 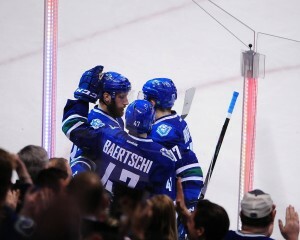 In the playoffs, Baertschi also put up 15 points in 21 games during the Comets’ run to the Calder Cup Final. Due to waiver-eligibility, it’s a sure thing that the 22-year-old Swiss forward will make the big club this season, and likely in at least a third line capacity. With the potential to be a top-six forward as the campaign progresses, Baertschi might not make a bad late round selection in a deeper draft. After a relatively solid rookie campaign that saw Linden Vey, acquired from the Los Angeles Kings for a 2nd-round draft pick (Roland McKeown), score 10 goals and 24 points, Vey looks to have the 4th line center spot on lock for this upcoming season. After spending much of 2014-15 on each of lines two through four, as well as snagging a decent amount of 2nd unit power play time, Vey appears to have a definite spot on the Canucks fourth line, likely playing alongside Derek Dorsett and Brandon Prust. While the addition of Brandon Sutter and the emergence of Bo Horvat will hurt the 24-year-old’s time on the man advantage, a 25-30 point season is doable, making Vey a nice pick late in a deeper draft.